I'm going to try and do some short blog entries that are showcasing some of the up and coming features of 3.0. We showed lots of people at Open World but for those of you that couldn't be there, stay tuned and I'll put a few things out. Another new thing being added is an alternative view of the objects in the schema. Simply right click on the connections and choose Schema Browser. Then you are presented with a drop list of the schemas and object type. 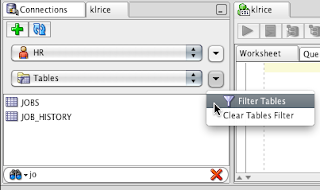 Then as with the tree based navigator, there is filtering. This view has 2 types of filtering. The first is when you click the down arrow as shown in the screen shot. 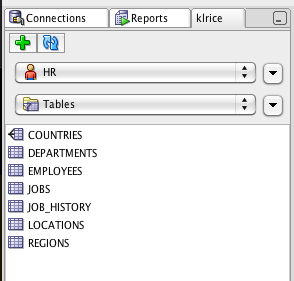 This takes you to the normal filter dialog and filters by adding a predicate to the sql retrieving a list of objects. The second is the binoculars at the bottom of the list. This does a very fast/simple client filter of the objects listed. As seen below with "jo" in the search.